We’re Interested in Superannuation Again, Are We? Last week the Productivity Commission released a report into superannuation. No surprise, it didn’t paint the best picture. Suggesting the super industry was lacking competition and accountability, while many funds were still acting in their own best interests and not their members. It came with a few recommendations from the productivity commission to address the problems and the always helpful media couldn’t miss their opportunity to fill a few pages with advice. The recommendations were good and bad. The report identified the issue of a super account being tied to an employer, meaning quite often a new job means starting a new super account with more fees and more insurance costs. And the account that an employee lands in is random, so they may well end up in a dud. The way to fix this was suggested to have super members defaulted into one of the best performing funds when they sign up. The list of the ten superstar funds would be available to the member at the point of signup and they could choose which one to become a member of. The top ten would be decided by an independent panel based on various criteria including governance, fees and returns. Of course, the problem with any ‘best of’ list that incorporates investment returns, it’s always going to be looking in the rear-view mirror. Not to mention the amount of squealing, lobbying and marketing that will accompany those funds that make the top ten and those that don’t. Bringing us to The Weekend Australian’s wealth section. The productivity commission’s report was always going to generate a few opportunistic columns and reports, wagging the finger, but providing little to no substance and probably more confusion. 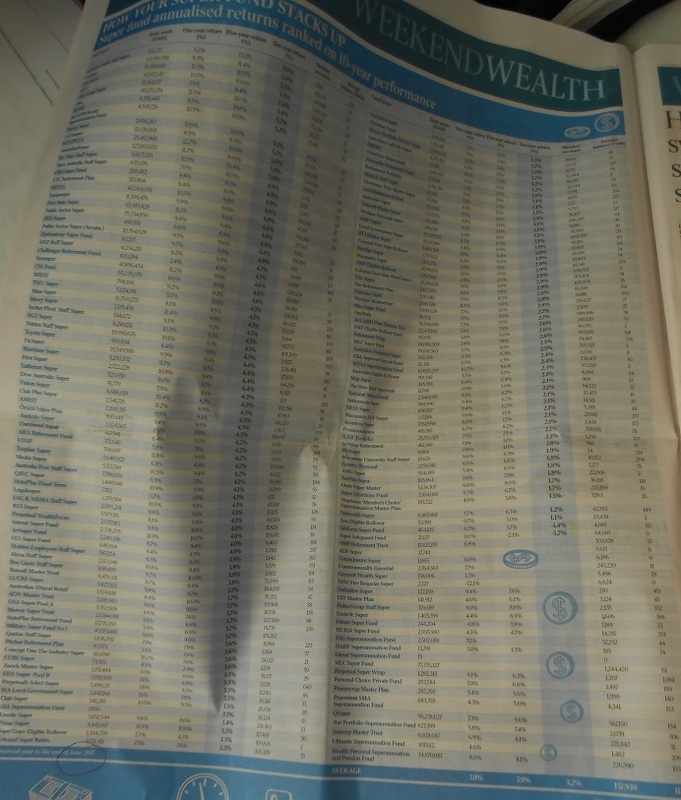 The Weekend Australian decided give readers a ‘wealth special’ and fill a full page with a table on how super funds have performed. No assumptions or notes given, just returns over one, five and ten-year periods. Congratulations to the Goldman Sachs Staff Super Fund who led the day. Here, pick you new fund. On the next page a bloke offered some advice on ‘how to switch your super the smart way’. Such is the lamentable state of investment journalism in Australia, the advice was essentially a bunch of stuff he’d copied from ASIC’s MoneySmart website. By the end of next week this stuff will have again faded from the memory and the media will move on to something else. They might get interested again next time someone important has something to say about superannuation. What should be said, is just like investing outside of super, having your future goals attached to your money is important. Even more important is having an investment philosophy you can rely on and one you’re prepared to stick with, so you can reach those goals. This is always going to serve an investor better than picking from a list, then repicking again later if they’re suddenly not happy with recent returns. Finally, the good thing about making predictions, you can always reserve the right to revise them. Australian house prices will push modestly higher this year and ramp up in 2019, according to ANZ economists, who say outright price falls are off the table. While the days of double-digit percentage price growth are now history, outright house price falls aren’t likely, according to senior ANZ economists Daniel Gradwell and Joanne Masters. In a research note published on Wednesday, ANZ senior economist Daniel Gradwell pointed to recent figures showing the rate of decline had accelerated in Sydney, with auction clearance rates slumping in Melbourne as well. “Weakness in Australia’s housing market has persisted longer than we expected, and the rate of decline in prices has recently accelerated,” Mr Gradwell wrote. “Additional headwinds are possible, such as the shift away from interest only loans,” he warned. “There could also be further tightening of credit as the impact of the current regulatory focus on mortgages flows through into lender behaviour.